Renewable Energy in Your Backyard? The main types of renewable energy are wind, solar, and hydroelectric. Energy companies around the world capture the energy available in these renewable sources and turn them into electricity. There are many of companies that turn renewable energy into electricity. Since 1995 the amount of companies that deal with renewable energy sources such as wind power, and solar power has increased by over 100% in the past 20 years. 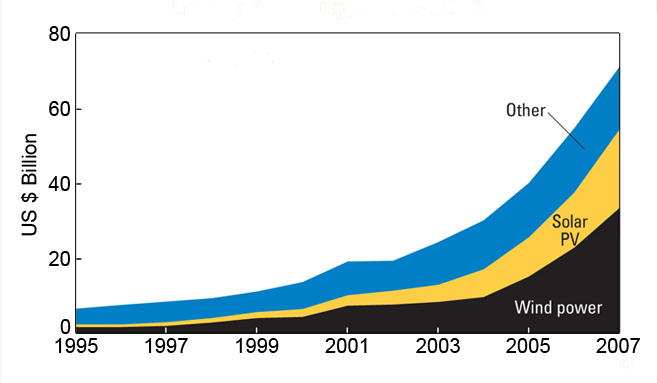 This picture shows the industry growth of companies that deal directly with renewable energy sources. Renewable energy is certainly on the come up and because of it less fossil fuels are being consumed and there is less pollution than there would be with out the renewable energy. The following graph shows the green house gas emissions of various energy types. On the far right the green house gas emissions of the fossil fuels is significantly higher than that of the renewable energy sources on the left. In 2013 About 67% of the electricity generated was from fossil fuels. Nearly every house in america is connected to the national power supply, and this means that the majority of the houses in America are largely powered by fossil fuels. The companies who are converting natural renewable energy into electricity use large scale equipment to harvest the energy, but is it possible small scale? What if we could harvest our own energy in our back yards? Between 2000 and 2013 there had been 2,261 MW of residential solar installed. Many people have solar panels, but they only really work if your house gets a lot of sunlight. If you lived in the woods what could you do? You can set up your very own hydro electric dam if you have a stream! It could be challenging to build a large scale hydro electric dam like the one in the picture above, but even a small scale hydro electric dam that you build your self out of spoons and neoprene magnets would be better than nothing. If every one in America that had access to a good spot to build a hydro electric dam, install solar panels, or build a wind turbine we could slowly increase the amount of renewable energy that is turned into electricity to power homes by a lot!